The contrast of pink and charcoal grey watercolor flowers against the cream backdrop of this dress is striking and unexpected. 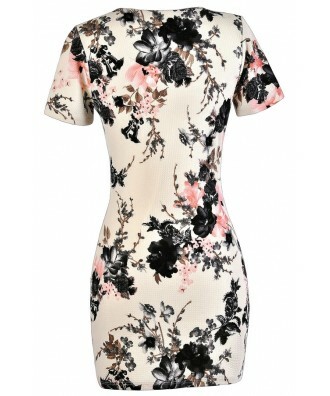 The Pink and Charcoal Grey Floral Print Crossover Hemline Dress is fully lined and made of a textured fabric. It has a rounded neckline, short sleeves, and a fitted cut. The crossover hemline of the skirt adds a chic, fashion-forward touch. The Pink and Charcoal Grey Floral Print Crossover Hemline Dress is perfect for any party or social event. It looks nice paired with pumps or wedges and a clutch. Details: Made in USA. Fully lined. 96% polyester, 4% spandex. Lining: 100% poly. Hand wash cold. Do not bleach. Hang or line dry. Small measurements: Length from top of shoulder to hemline: 32". Bust: 34". 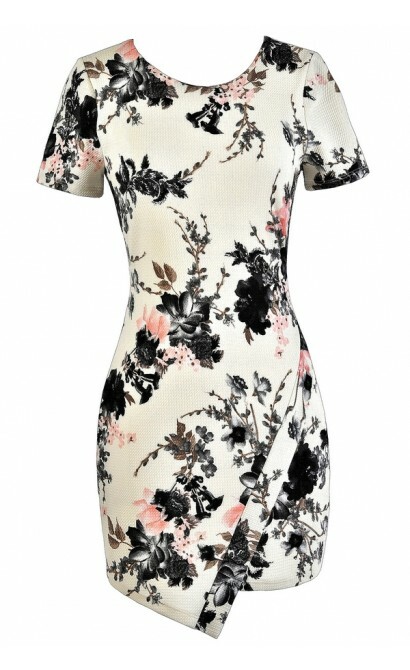 You have added Pink and Charcoal Grey Floral Print Crossover Hemline Dress into Wishlist. You have added Pink and Charcoal Grey Floral Print Crossover Hemline Dress for Stock Notification. 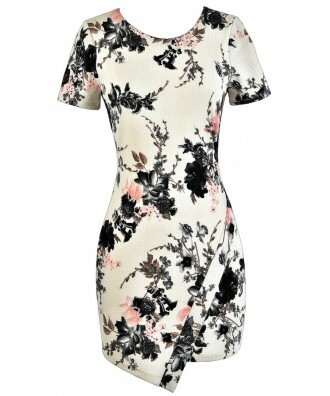 You have set Pink and Charcoal Grey Floral Print Crossover Hemline Dress as a loved product. 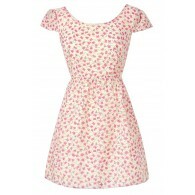 You have removed Pink and Charcoal Grey Floral Print Crossover Hemline Dress as a loved product.